In his hilarious new sci-fi series, Jim C. Hines introduces the unlikely heroes that may just save the galaxy: a crew of space janitors. Why I want to read it: This one caught my eye from the first moment I heard about it. I enjoy the Guardians of the Galaxy movies, a set of misfits who save the world, and this one gives off a similar vibe from the description. I love that the heroes of Terminal Alliance are janitors. I cannot wait to read this one! A very practical marriage makes Alexander Westcott question his heart in the latest Regency romance from the New York Times bestselling author of Someone to Hold. When Alexander Westcott becomes the new Earl of Riverdale, he inherits a title he never wanted and a failing country estate he can’t afford. But he fully intends to do everything in his power to undo years of neglect and give the people who depend on him a better life. . . .
Why I want to read it: I almost passed this one by, but after reading the description, I am more than curious about Alexander and Wren, and their situations. What is Wren hiding? And how will Alexander react when he learns the truth? I also like that this one seems a bit role reversal. Usually it's the female love interest who wants to seek out friendship and respect in marriage. I think I like Alexander already. Do either of these sound like something you would like to read too? Terminal Alliance sounds hilarious! I had no idea HInes had another book out! Verushka - I think so too! I can't wait to read it. I have never read anything by Hines before, so I think I'm in for a treat. Thanks for visiting! Terminal Alliance sounds good. I love science fiction. Science fiction parody can be so good when it is done right. The plot description on this book is appealing. The cover is also cool. Brian - I enjoy science fiction too. My problem is I enjoy so many other genres too. I am looking forward to Terminal Alliance. Hopefully it will turn out to be a good one. Thank you for stopping by! 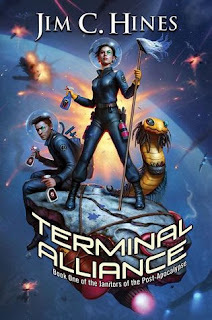 I think I would enjoy a funny science fiction novel like Terminal Alliance. Kathy - I hope it turns out to be as good as it sounds! I just love the name of the series: Janitors of the Post-Apocalypse . The book sounds really fun. Nina - Haha! Me too. Hopefully it will live up to our expectations. :-) Thanks for stopping by! I definitely want to read Terminal Alliance, it sounds pretty funny! I want to read it just to read a story about janitors! I LOVE the sound of Terminal Alliance - but Daw don't do ebooks:(. 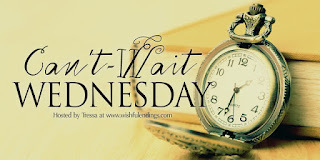 Sarah - I was able to get an e-copy via NetGalley, thankfully. Although, with that cover, I'd probably be willing to splurge for a paper copy. Hopefully it will be as good as it sounds! :) Joining The Terminal Alliance fans! I could use some comical escapades right now! Jenclair - I could too! I hope I can read it soon. I need to start reading some sci fi books and this book sounds awesome! Great picks! Ronyell - I am trying to read more Sci Fi, although don't think I'm having as much luck as I hoped. I'll keep trying though. :-) Thanks for stopping by! I can't to read Terminal Alliance. I already have a copy and hope to get to it mid-November. Great choices. Barb - I hope I can read it soon as well. It sounds like a lot of fun. I hope you enjoy it! Lauren - I hope you get a chance to read it! Hopefully it will be as good as we hope it will be! Thanks for visiting, Lauren! I would definitely check out the Mary Balogh book. I've read a couple of hers and they've always been good reads! Iliana - This will be my first by her, and I am looking forward to it. I am glad to hear you have enjoyed her books in the past! 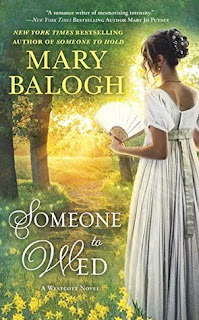 I love Mary Balogh though I am so behind on her books! I've really liked her latest covers. So much better than the old clinch covers. Terminal Alliance looks really fun but I'm going to wait for your thoughts before I pick that one up. The cover of Someone to Wed is simply gorgeous! I would definitely read both of these. Great picks! Carole - I think so too! I am looking forward to reading these at some point.